Speech by Zac Goldsmith, MP for Richmond Park and North Kingston - which due to his unavoidable absence in the House of Commons was read by Professor Guillebaud on his behalf, on the afternoon of 5th June 2014, to all attending the 20th Anniversary of the eco-timecapsule project. 20 years ago, many people, including some present today, apologised to future generations for the appalling mess they will inherit as a result of our behaviour on this - the only planet capable of sustaining us. 20 years later, our world is still in desperate trouble. As human numbers expand the natural environment is suffering an unprecedented assault. Forests are shrinking, species are disappearing, oceans are emptying, land is turning to desert. The climate itself is being thrown out of balance. In just a few generations, we have created the biggest threat to the natural world since humanity evolved. Unless something radical is done now, the world in which our children grow up will inevitably be less beautiful, less bountiful, more polluted and more uncertain than ever before. We are rapidly altering the very systems on which we depend. Without coral reefs and mangroves and with worldwide over-fishing fish stocks simply collapse. Without bees or wasps, many plants cannot be pollinated and will not grow. Without rainforests, the planet loses not only thousands of as yet undiscovered species, but also a 'carbon sink' that helps slow climate change. Only through our destruction of these things have we come to realize just how irreplaceable they are. At the root of all this is simple mathematics. The human population is growing, along with our hunger for resources - but the earth itself isn't. It's an uncomfortable fact, an inescapable truth. Oil and gas will run out, and what remains is in the hands of countries we can't always rely on. Feeding the world is becoming harder, the world's great breadbaskets are shrinking at an alarming rate, and water shortages now affect more than a hundred countries. Of the world's 17 great fisheries, 15 have either collapsed or are on the brink of collapse, leaving a quarter of a billion livelihoods hanging in the balance. All this, and there remains the biggest environmental challenge of all - climate change. There comes a moment where faced with such a barrage of bad news, people are inclined to throw their arms in the air and simply give up. But, while the problems are real and vast, they are not yet insurmountable. I believe that almost everything that needs be done is already being done somewhere in the world. And where companies, communities and even governments have blazed a trail, they have not only done the right thing, their members, customers, voters - have rewarded them for doing the right thing. Solutions exist! But they need to be on the same scale as the problems. Today we must renew out apology to our grandchildren but simultaneously pledge to act collectively in all the ways that could and should render that apology obsolete. 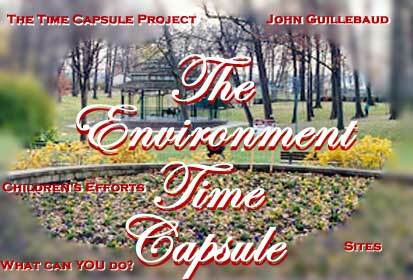 The location of this eco-timecapsule is highly appropriate. Kew Gardens is home to another environmental timecapsule containing seeds of basic food crops and endangered species and placed just 200 metres from here under the Princess of Wales Conservatory in 1985 by the man for whom the term 'national treasure' was invented. Sir David Attenborough is of course is a patron of Population Matters who are co-sponsors of this day, and I happily join them in underlining the need to tackle population growth alongside reduced consumption and improved technology to reduce our collective environmental impact. I want to end by quoting the great Wendell Berry: "Whether we and our politicians know it, Nature is party to all our deals and decisions, and she has more votes, a longer memory, and a sterner sense of justice than we do."